rec. 2016, St Augustine’s Church, Kilburn, London. DDD. Composed to a libretto by Pietro Metastasio, Il Sogno di Scipione is set in Africa in 200 B.C., and tells a tall tale of gods both benign and vengeful, with the hapless Scipione stuck between moral choices and a tug of war between heaven and Earth. This is counted amongst Mozart’s youthful works as it was originally written when he was aged 15. The death of the original dedicatee Prince-Archbishop Sigismund von Schrattenbach scuppered its premiere, and it seems it was never performed in its entirety during the composer’s lifetime. Classical Opera conducted by Ian Page has been producing a fine set of Mozart opera recordings for Signum Classics, and I very much enjoyed Il Re Pastore back in 2015 (review). 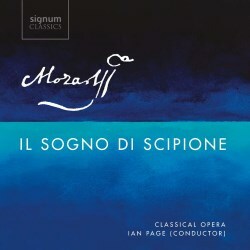 As a one-act ‘Dramatic Serenade’, Il Sogno di Scipione is far from conventional when it comes to plot, and as Ian Page’s booklet note points out, Mozart had to create something out of a text that lacks any real character development or dramatic action. With nine arias, a chorus, and a variety of connecting recitatives, the impression is however pleasantly familiar. Singing is consistently of high quality in this performance. The mood is set from the outset, with the mild-sounding Scipione being badgered by Constanza and Fortuna to decide between them. Stuart Jackson is good as Scipione, not imposing artificial grandeur to the part while at the same time giving plenty of backbone to Mozart’s virtuoso flourishes. Klara Ek as Constanza is more girlish and flighty than the bossy Fortuna, sung by the sometimes quite imperious sounding Soraya Mafi, and their voices are distinct enough to make the opening scenes convincing. The celebratory nature of this work is embodied in the chorus’s heroic Germe di centro eroi, nicely balanced between full voice and tutti orchestra. Krystian Adam as Publio has the right kind of tenor, if a little youthful sounding, to fit the role of Scipione’s late adopted grandfather and war veteran. Scipione’s late father Emilio, sung by Robert Murray, is both an authority figure and an intangible resident of heaven, his voice sometimes dragging just a smidge behind the orchestra in his single aria Voi collagiù ridete but otherwise perfectly fine. The final resolution is taken by Chiara Skerath as the muse Licenza, the clarity of whose soprano voice delivers a closing statement against which no-one will be arguing any time soon. There is also a recording of Mozart’s original version of her aria as an appendix track after the closing chorus. There are but few few competitors to this recording, some of which nestle amongst out of print complete Mozart editions, and others, such as the 2001 release with the Freiburg Baroque Orchestra conducted by Gottfried von der Goltz on the Naive label, are also deleted and hard to obtain. Il Sogno di Scipione is decent enough Mozart but not great opera. The arias are all well-written but there is nothing particularly memorable, and there are none of those ensemble set pieces with which Mozart would later excel. There’s rather a lot of vapid indecisiveness and no real human emotion to get stuck into, though as mentioned above this is not Mozart’s fault. As ever, the Classical Opera company gives a very fine performance and the recording is excellent. Collectors of this nicely designed and well produced series need not hesitate.